News from the art world including comments from the curator of Gallery Al-Quds. John Halaka’s work is included in an exhibition titled “Grieving Empire” at the Aspace Gallery, in Toronto, Canada. The exhibit is curated by Rachel Gorman and will run through March 18, 2017. Gallery Al -Quds congratulates artist Helen Zughaib, who was awarded a grant from the District of Columbia Arts and Humanities Fellowship Program FY17. The highly competitive award recognizes artists whose artistic excellence significantly contributes to the District of Columbia as a world class cultural capital. AHFP recognizes the impact of individual artists within the District of Columbia and supports the vitality that those artists bring to the local community. “Jerusalem, 1000-1400: Every People Under Heaven,” at the Metropolitan Museum, is a captivating show of some two hundred objects from the era of the Crusades. There are manuscripts, maps, paintings, sculptures, architectural fragments, reliquaries, ceramics, glass, fabrics, astrolabes, jewelry, weapons, and, especially, books—in nine alphabets and twelve languages. The works, from sixty lenders in more than a dozen countries, express the Jewish, Islamic, and Christian cultures of the time, the three great Abrahamic faiths sharing a city holy to them all, when they weren’t bloodily contesting it. The third edition of Qalandiya International (QI), a biennial-style initiative, is due to launch next month across towns and villages in Palestine (5-31 October). The project, based on the themes of return and refuge, includes a new version of the Tent Embassy work by the Aboriginal artist Richard Bell, which will go on show at the Shuafat refugee camp in East Jerusalem. 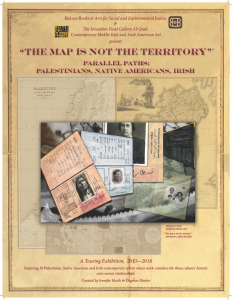 The exhibition, The Map is Not the Territory: Parallel Paths: Palestinians, Native Americans, Irish is on view at Santa Fe University of Art and Design until October 15. Vian Borchert, The Internationally Accomplished Expressionist Artist Exhibits in Washington, DC. Vian Shamounki Borchert prepares to serve Washingtonian art enthusiasts a lesson in cosmopolitan interpretation. A professor, a mother, and extensive traveler, Vian possesses a unique and valuable talent for writing poetry through expressionist art.